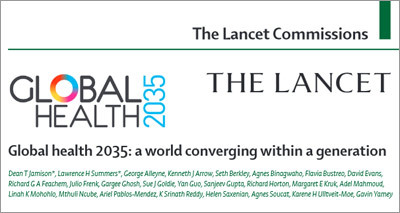 For the first time in human history, we have the financial and technical capacity to eliminate health disparities between poorer and wealthier nations, according to a major new report, Global Health 2035: A World Converging within a Generation, published in The Lancet. Through an ambitious, but feasible, investment plan, authors show how governments and donors could achieve a "grand convergence" by bringing preventable infectious, maternal and child deaths in all countries down to the levels currently seen in the best-performing middle-income countries within a generation. Now, for the first time in human history, we are on the verge of being able to achieve a milestone for humanity: eliminating major health inequalities, particularly inequalities in maternal and child health, so that every person on earth has an equal chance at a healthy and productive life. The powerful drugs and vaccines now available make reaching this milestone affordable. It is our generation's unique opportunity to invest in making this vision real. The authors urge world leaders to incorporate this "grand convergence" into the UN's post-Millennium Development Goals Framework. If the report's recommendations for increased global investment in health are followed, the authors estimate that in the year 2035 alone, roughly 10 million lives could be saved in low-income and middle-income countries, eliciting enormous social and economic gains for the countries most affected. The commission urges policymakers to adopt a "full income" approach to measuring national income, combining growth in national income (GDP) with the value people place on increased life expectancy (the value of their additional life years or VLYs). Calculated using the full income approach — “which is increasingly advocated by economists — “the benefits of achieving the grand convergence will exceed costs by a factor of 9-to-20 for low-income and lower-middle-income countries from 2015 to 2035. According to Dr. Dean T. Jamison, Professor of Global Health at the University of Washington and co-chair of the Commission, "We believe that if nations worldwide adopt a full income approach to economic planning, the human returns to investing in health can be brought into resource allocation decisions. People value a longer and healthier life, and the notion of full income simply places that value in monetary terms. While it does not put a monetary value on an individual's life, it does place a value on changing mortality risk, which traditional notions of GDP neglect." 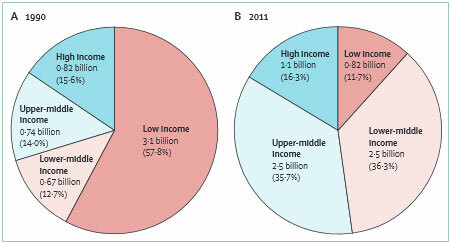 The Commission outlines a detailed investment framework for low-income and middle-income countries, showing where spending should be prioritized; aggressively scaling up new and existing tools to tackle HIV/AIDS, TB, malaria, neglected tropical diseases, and maternal and child health conditions; and focusing on high-burden settings, especially poor, rural sub-populations of middle-income countries. Early investment in family planning is a priority. Moreover, with predicted rises in GDP in low-income and middle-income countries, the report's authors suggest that many countries will be able to meet much of the increased investment from their own resources. "Due to important changes in the global economy and success of development efforts," Dr. Summers added, "the role of international assistance, while still vital, is going to increasingly emphasize scientific research, provide templates and models that can be emulated, and focus on development of techniques and dissemination of information. International assistance will remain critical, but it is less about financial support to individual countries and more about the provision of global public goods. Development assistance budgets should reflect that important reality." The international community particularly needs to make a concerted increase in investment into research and development (R&D) to develop new drugs, vaccines and health technologies, say the authors. Current global investment in R&D needs to be at least doubled, from current annual spending of $3 billion to $6 billion annually by 2020, with half of the increment potentially coming from middle-income countries. The report outlines inexpensive policies and interventions that could curb the emerging burden of non-communicable diseases and injuries, prevent additional deaths by 2035, and raise significant new revenue for low-income and middle-income countries through, for example, increasing taxation on tobacco and other harmful substances, such as alcohol and sugar. In China, for example, a 50 percent tax on tobacco could prevent 20 million deaths and generate an extra $20 billion a year over the next 50 years. Also, the report argues that the goal of universal health coverage (UHC) — if implemented with the poor in mind — “could sharply reduce the high levels of impoverishment from out-of-pocket health spending." Investing in health is also an investment in prosperity, social and financial protection and national security. What our Commission underlines, in an original and compelling way, is that investing in health means investing in a quality human beings value deeply, but which we do not capture well in our usual measures of development. A fuller accounting of health, as the Commission shows, reveals its broader significance, which we each hold true. When English surgeon and social reformer Thomas Wakley founded The Lancet in 1823, he announced, "A lancet can be an arched window to let in the light or it can be a sharp surgical instrument to cut out the dross, and I intend to use it in both senses." This philosophy remains at the heart of the journal today. As an independent, authoritative voice in global medicine, The Lancet publishes medical news, original research, and reviews on all aspects of clinical medicine and International Health. TheLancet.com website publishes important journal content online ahead of print publication. The Lancet became part of Elsevier in 1991. Learn more about The Lancet here.